Anemia is one of the most common blood conditions that American adults face, and seniors are particularly susceptible. However, because the symptoms mimic so many other things, it can be difficult to diagnose. Family caregivers and elder care providers should keep an eye on aging adults to see if all the clues add up to anemia. This will motivate them to take the senior to the doctor for a diagnosis and treatment. What is Anemia and Why is it Common in Seniors? Anemia is a condition where there aren’t enough red blood cells to carry oxygen. The most common form of anemia is an iron deficiency. Seniors can become anemic in several different ways. Most people get their iron from their diet, so if an elderly person is not eating healthy meals and is instead relying on junk food or fast food, they could be depriving themselves of this nutrient. The deficiency can be so small at first that it isn’t noticed, but as the anemia grows, the symptoms become more pronounced. Without proper red blood cell counts, seniors can face serious health concerns as a result of the anemia. Anemia in elderly adults can also happen via blood loss, digestive issues, and chronic diseases that interfere with the production of red blood cells. Recognizing the Symptoms of Anemia. Spotting anemia in elderly adults is a real challenge, because many of the most common symptoms are quite similar to other conditions. 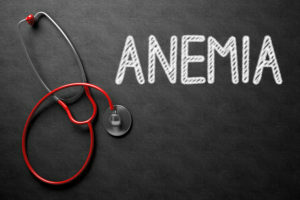 In the early stages, there may not be many symptoms at all and anyone not familiar with anemia may overlook them altogether. It’s easy for seniors to go undiagnosed with anemia for a long time. Among the most frequent symptoms of anemia are fatigue, shortness of breath, rapid heart rate, headaches, and pale skin. Of course, so many of these symptoms are the same as many effects of old age and age-related chronic conditions. That’s why it’s so important for family caregivers and elder care providers to connect the dots to realize something may be wrong with the aging adult. Treatments consist of iron supplements and modifications to diet, in most cases. Elder Care Providers Can Help Prevent Anemia in Seniors. Family caregivers and elder care providers do a lot to ensure aging adults are healthy and comfortable. Because anemia is often preventable, they can take steps to ensure the senior’s diet is iron-rich to avoid certain types of the condition. Because seniors often don’t cook for themselves when they have family caregivers and elder care providers to help, it’s up to others to deliver healthy and nutritious meals. To enjoy an iron-rich diet, seniors should eat fresh fruit, dried fruit, egg yolks, greens, whole grains, nuts, red meat, seafood, and beans. With an iron-rich diet, aging adults can avoid anemia and stay as healthy as possible.